After waking up around 9, I tiptoed through the apartment to reach the door without waking Conchita or Liz up. I then ran through Barcelona, not exactly where, but away from the ocean and in the direction of the mountains. Somehow I did end up at Parc Guell from another entrance, so I do have to give myself directional credit. I can get myself mixed up in a city, and still find my way back. Worked on some planning and religion notes while eating my daily breakfast of yogurt and half a banana. We are so fortunate to have access to our food and that Conchita was nice enough to buy us things that made us comfortable, like yogurt. Some people in home stays, as mentioned before, don’t have access to food or the kitchen and are still being served weird food. I am ready for the cooler weather of Paris. It is supposed to be in the mid to low 60s, which should be a welcome relief from the 80 degree humidity. Not as bad as the 90s in Southern California, but even the front page of La Vanguardia, a Barcelona newspaper picked up on the odd weather trend with a headline stating “Agosto en Octubre” and accompanied by a picture of people at the beach. This would be unheard of any other year. But of course when Kaitlin is coming to Spain, it would be extra hot. 🙂 That’s ok, I’m learning to deal with it. Sort of. Religion consisted of more review about the Great Mosque of Cordoba. The lengthy discussion was aided by a lovely surprise of candy corn from Bonnie, or rather Bonnie’s mom. What made this batch of candy corn so fabulous was the mix of flavors, the chocolate corn, regular flavor, and the surprise pumpkin pieces. It is all pure sugar and food coloring, probably pure cancer, but the strange flavor and texture makes this time of year complete. 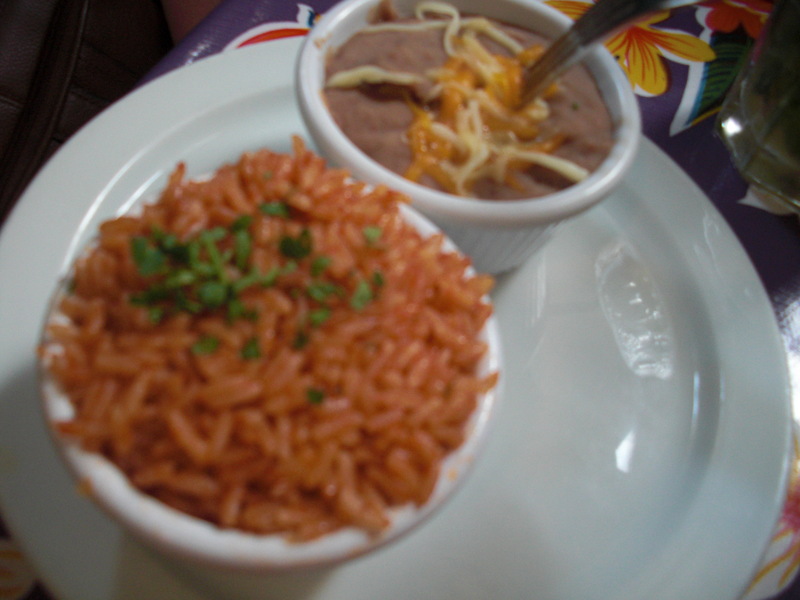 For lunch, I tagged along with Bonnie and Dana to Rosa Negra, a Mexican food place along Laietana. It was my first time eating there and boy was it tasty! 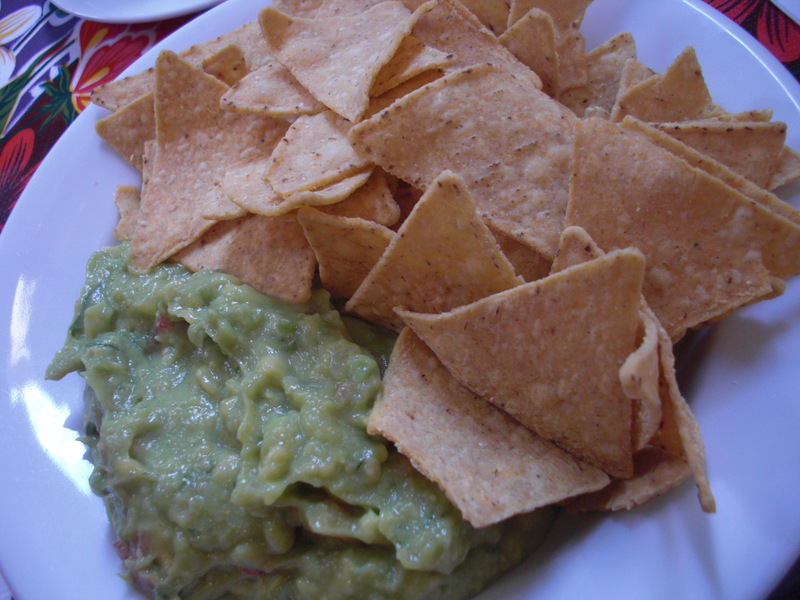 I ordered the chips and guacamole, but definitely created a mental list of the food items I would be ordering in the future. 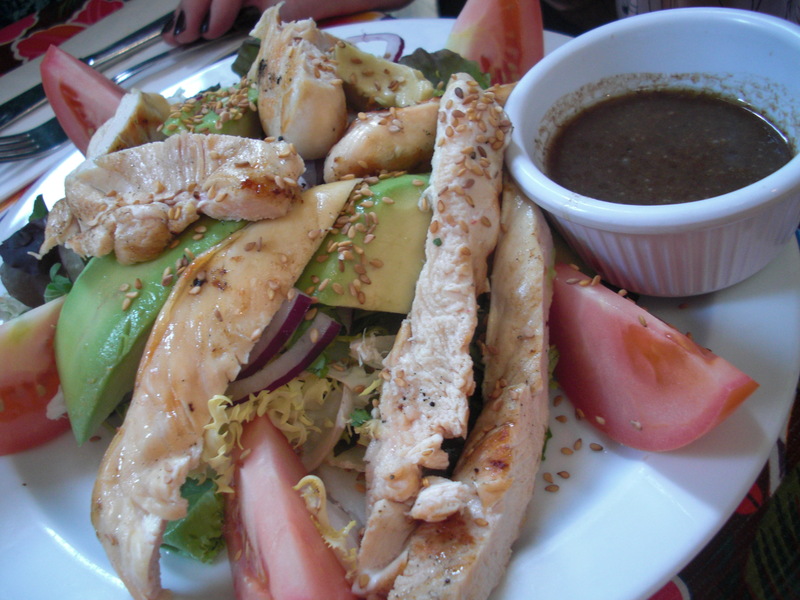 Dana had the chicken salad (with tender, grilled chicken strips, avocado, onion, tomatoes, and a vinaigrette) and Bonnie stayed with an order of rice and refried beans, both of which came in tiny bowls, the size of kid’s portions. I guess that makes sense for just 1 Euro. 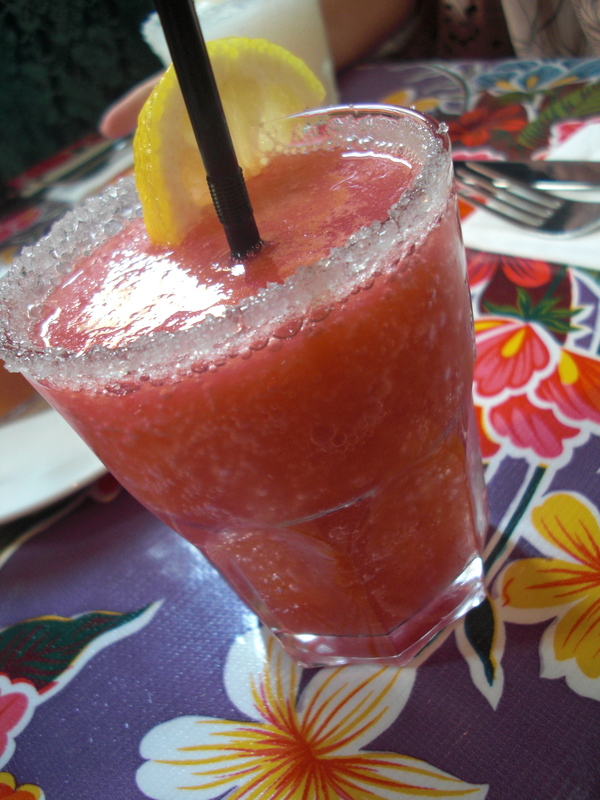 Something fun for Rosa Negra, is their continuous happy hour prices of 3.50 margaritas and mojitos. 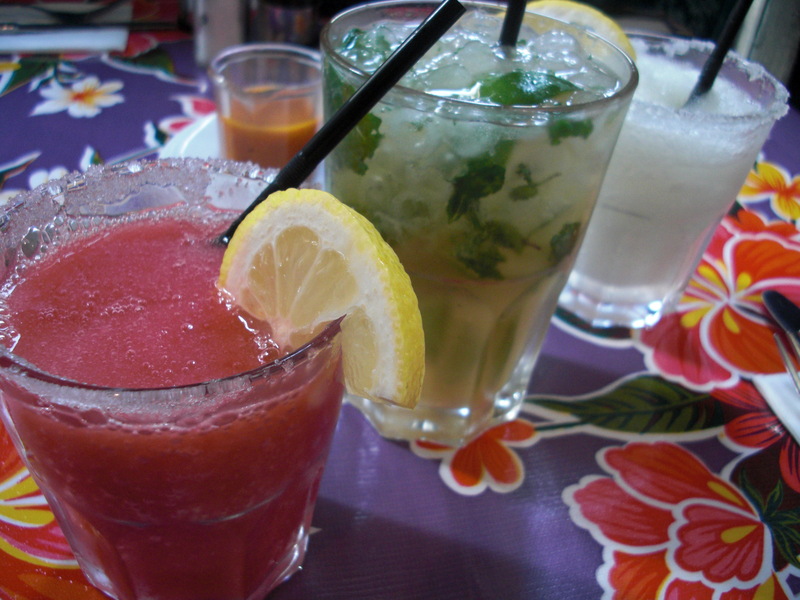 Dana got a regular margarita, Bonnie a mint mojito (but didn’t really like the mint at the bottom of the glass), and I tried the strawberry margarita and was not disappointed. All together, que delicioso! In communication we listened to one student report on three types of news: international, national, and local. Even though I am out and about more than I would be at Santa Clara, I still don’t feel like I am staying informed with what is happening in the world. I should probably start trying to read the headlines online, or purchase a newspaper every few days just to keep up or try to educate myself. After the breakdown and analysis of news, I listened to a presentation on the markets of Barcelona. It is fascinating to understand how important the markets are to the people, politics, and the way of life. I am very excited to shop from my own little market in Santa Clara for my food weekly. Maybe even make some friends with the vendors. The market is central for entertainment, shopping, keeping in touch, etc. But it is also a dying art due to technology and the necessity to speed up our lives. People are resorting more to fast food, prepackaged food, and online ordering and delivery systems. I completely understand our need for this, but it does make it sad that the art of cooking a meal or even getting to know the people that sell us the food or the people that are essentially touching and preparing our food. For the walk home, we decided to stroll through Passeig de Gracia, as we really didn’t have anywhere we needed to be. After stopping in a couple of fun stores, today’s big name brand was Burberry, we made our way back and started to pack for Paris. How exciting to pack for colder weather! I am now able to bring out this fantastic green jacket (JCREW of course) that my mom and grandma helped me pick out. I did pack a few tank tops to wear as well, because I never exactly know how hot I will get, no matter the weather. 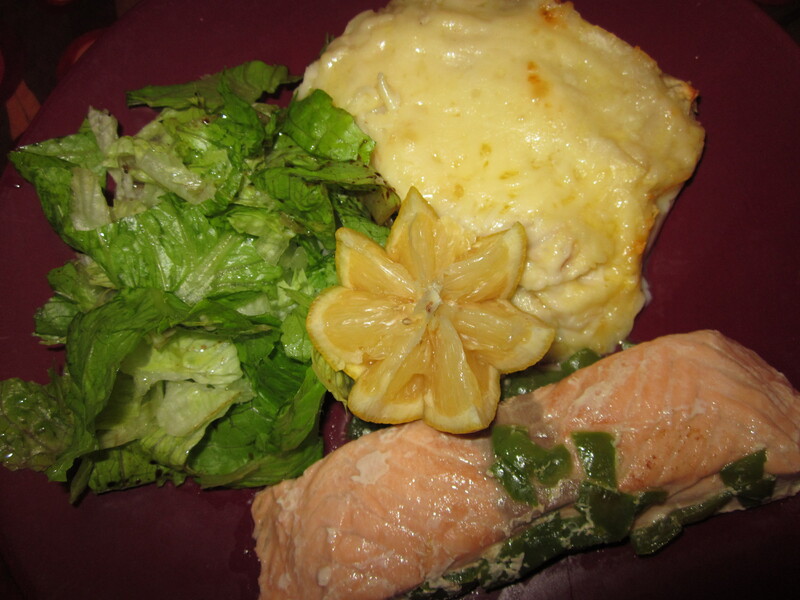 All day I had been thinking about lasagna and sure enough, for dinner we had some meat lasagna, lettuce, salmon, and baguette. I say “some meat” because I am unsure if it was tuna or a really fine ground beef. Either way, it had an alfredo sauce on top with some melted parmesan cheese and was crisped to perfection. We have incorporated the Lawry’s season salt or “sal de tu abuelo” to our table and that was added to the salmon. Perfection at its best. During the meal, I tried to explain the deliciousness of candy corn and even gave Conchita a mini packet to sample, but I think she was a little skeptical. She did try to give us some suggestions (many that we have already heard) about the baguettes, crepes, croissants, and so on in Paris. Don’t worry, we will cover all the playing fields and will report back on Sunday. While uploading my pictures for today I was notified that I had exceeded my capacity and needed to purchase more space for my pictures. I reasoned that $20 is not the end of the world, especially if it allows me to incorporate my pictures into the blog. 🙂 So upgrade it is.